The interior decoration of the walls can be made of various materials - the good is that the choice is large enough. If earlier all the surfaces were tried to make as smooth as possible, now it is irrelevant, especially when the clinker tiles were used for interior walls. What is this material, and how to work with it? Answers to these, as well as other questions, can be obtained by reading the article. Based on several different grades of clay, which are mixed to ensure uniform properties of the raw materials. 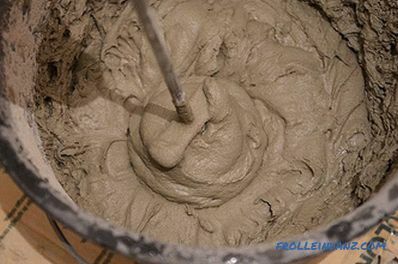 If the clay is too greasy, then sand is used to deplete it. The mixture is crushed, and it is given the desired shape using a belt press. 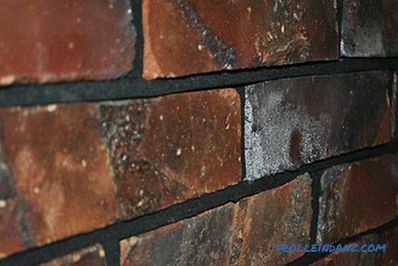 Depending on the grade, clinker can have a smooth surface, textured embossing or a sandy coating. After drying, the tile blanks go through a tunnel kiln through heating, firing, and cooling. At the final stage, the tile is tapped in separate drying chambers. 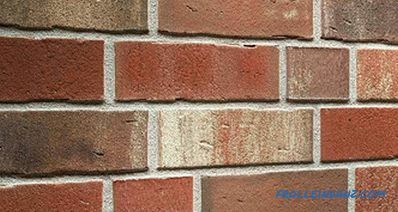 The brick tile has advantages and disadvantages that it is important to be known to anyone who has decided to use this facing material. The tile is durable and resistant to abrasion, which is a great advantage when facing the floor. If the room is flooded with sunlight, then you will not have to worry that some of the cladding material will burn out and its shade will become brighter. Clinker does not care about exposure to chemicals, as it has a low porosity. When contaminated, the material is easy to clean. 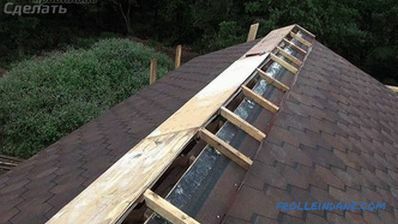 Even a non-professional can handle the laying of the clinker tile. This is an environmentally friendly material. The tile is wear-resistant, but at the same time it is fragile (first of all it concerns budget-grade materials or fakes, but for interior work it is not so important). Most likely to buy a fake, so it's best to invite a specialist to help him figure it out. It is necessary to use high-quality, but expensive grout, and its consumption is considerable. Ordinary finishing tiles. It is in this segment that the most colors and shades are observed. 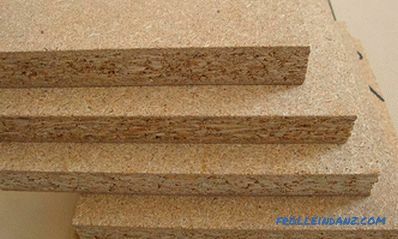 Designed for interior decoration with moderate humidity, as the material is porous. It is successfully used both in the kitchen and in the living room and similar areas. The tile is moisture resistant. This material with minimal water absorption, which is not afraid of significant temperature drops. It is possible to use not only for facing of a bath, but even in a sauna. Glazed tiles Not only more beautiful, but also the degree of moisture resistance is higher. Smooth. This type of tile is most common. It is easy to wash, but due to slipperiness it is used for wall covering. Rough. This tile is also in demand for decorating the walls in those rooms, but since it is not easy to wash off dirt from such a surface, it is better not to use it in the kitchen. Glazed. The glaze is applied on a flat surface, so this smooth tile looks very original. Rustic. It looks like a roughly treated stone. Often used to finish a wall of a room to emphasize the chosen style. The brick tile stands out against the general background for its roughness, so it will look original in a room only with a skillful design approach to its use. Now let's look at how to choose a clinker tile. As for quality, we have already figured out, now we will touch on the design techniques. Tile size can differ significantly a significant impact on the visual perception of the room, but the use of clinker tiles makes the wall more expressive and visually brings it closer. 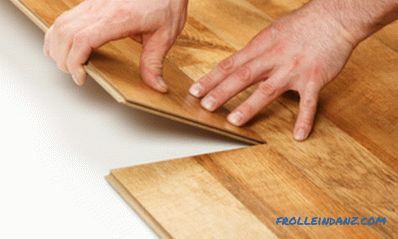 So, if you fully veneer a small room, then it will seem tiny, so it is better to finish any one wall. A large room can be fully veneered with clinker, and it does not seem small. The size of the tile used is also important. 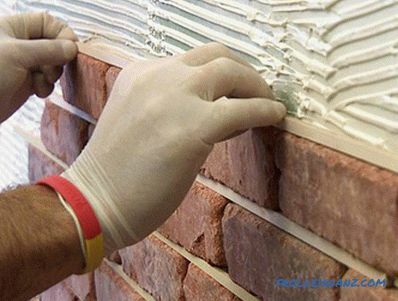 For small rooms, brick-sized clinker can be purchased, while in larger rooms it is better to use more dimensional facing material. In order for the clinker tiles in the interior of the room to look original, besides the size, you need to take into account its color, scope and chosen interior style. Loft . This style is very specific, resembling a room in which it had long been necessary to plaster walls and hide communications — this is how abandoned enterprises and warehouses that received a second life looked like at one time. It is this effect that is achieved when one or all of the walls look as if the repair has not yet begun. If you use too dark clinker, the situation can turn out to be oppressive, and even very good lighting will not correct the situation. Techno . In the style of techno tile plays the same role, but the surface of the facing material should be smooth, the color is varied, and the shape is geometrically correct. 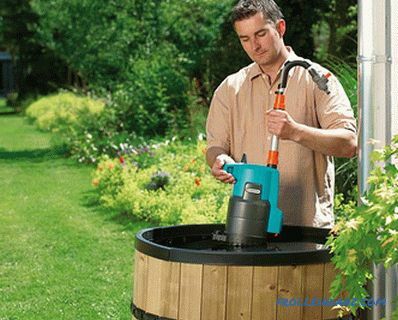 Country Style or Country . This is a generalized concept, because in each country, their concepts of the village, and the villages themselves are different. 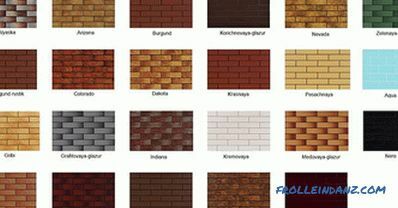 For example, in the English style, natural color is welcomed, and in order to create a German and Dutch style, you will need to purchase a bright red clinker tile. A house can be not only rustic, but also hunting. In such houses there is usually a fireplace. When transferring the style to urban apartments, they began to install false-fireplaces, and the use of clinker allowed to make the original lining. 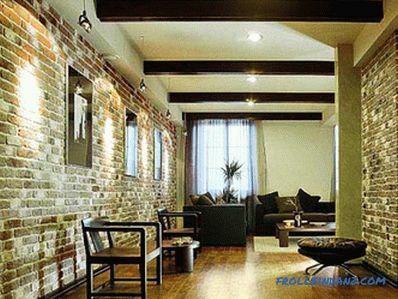 In this style there must be a combination of brick walls and natural wood. Rustic . The style involves the use of large, roughly treated tiles in a large room. 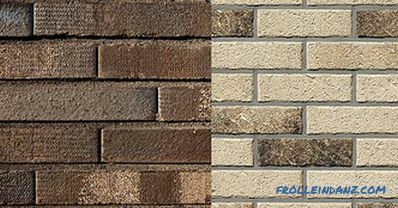 Aged clinker is very suitable for this purpose, but it is better that the tile be of different shades. Hi-tech . In this style, preference is given to smooth surfaces, so tiles are rarely used. If you want to highlight a fragment, then you should select a clinker that emphasizes the overall background. Gothic . This style is characterized by black and dark colors, so small brickwork (in combination with black grout for joints) can emphasize the preferences and tastes of the owner. Minimalism . Clinker is used to highlight a zone and helps focus attention on planes. You can use any tile. So, the choice is made, now you can proceed to the preparatory activities. In order for the work to be done qualitatively, and the result was pleasing to the eye, one should responsibly approach the cleaning of the walls. If on the surface remains lime, pieces of old wallpaper or grease stains, then in these places the tile will stay bad, or even completely fall off. 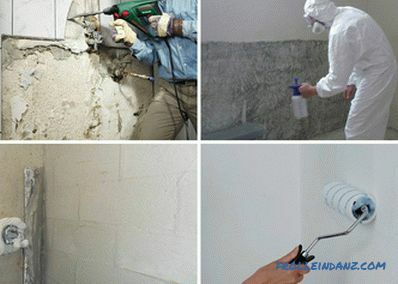 Upon completion of the cleaning, it is necessary to check the flatness of the walls with a building level, and if the drop is too substantial (more than 2 mm per 1 m), then you will have to apply forces to level the surface. Before installing the wall tiles should be primed. 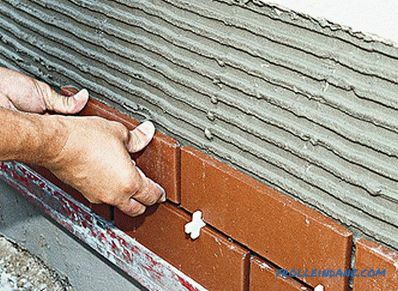 For installing clinker tiles indoors There is no need to buy glue with enhanced fixation, as extreme conditions, such as when exterior finishing, will not occur. In addition, given the peculiarity of the material with which to work, you need to completely abandon the hard mixes, preferring elastic. 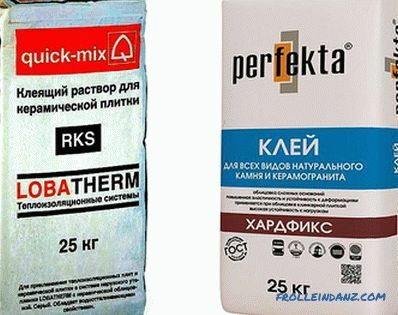 The solution, which was kneaded more than 30 minutes ago and did not have time to use, should be discarded, and in no case should the dry mixture be mixed into it.
. You need to mix the mixture with a mixer - this is will guarantee no lumps. First, water is poured into the container, and then the dry mixture gradually pours out. The consistency of the solution should be brought to the state of thick cream, then let it "ripen" for 5-10 minutes. You should not make a large batch, as the solution can be used for half an hour, after which it loses its adhesive properties. crosses or other material with which the desired inter-row clearance will be set. First, the markup is applied to the walls using the existing level, and the tile will be laid on it. 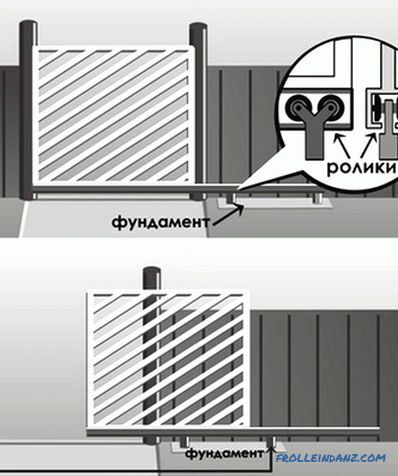 For ease of installation, as a support for the first row of cladding material, the CD profile can be fixed to the wall. A thin layer of adhesive is applied to the wall. Also tile is coated with a solution that literally needs to be pressed into it. After that, the solution is added, leveled with a comb spatula on the tile, and now it can be glued to the wall, leveled and tapped with a rubber hammer. This is how the entire row is glued. After that, the rule is to check how smooth the top edge is, and, if necessary, trim it. Approximately in the middle, you need to draw a vertical line from the seam, which will be a guideline for each odd row - the junction of tiles will pass along it. The next day, you can perform grouting. As you can see, the cladding of the walls with clinker tiles may well be done by a non-specialist.